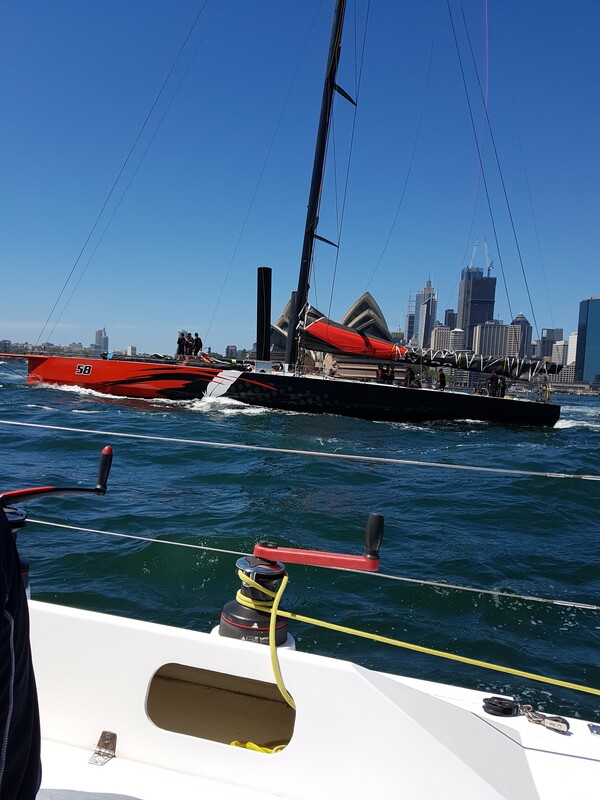 On Boxing Day we did a leisurely load up of Passion X and made an early departure for the start area of the Sydney to Hobart race. We bid farewell to Jackpot moored up at Greenwich Flying Squadron waiting for well wishers to wave them off and headed out. On the way we found ourselves alongside Comanche and doing identical boat speed under motor. I was a bit unnerved when they swung out to our line just before the Harbour Bridge but soon realised that they were seeking the highest clearance point for their tall mast and instruments to clear. Past Kirribilli we managed to get some separation and watch other yachts preparing for the trip south. At Middle Harbour we went into the shelter of the head to get away from the boat wash and when I went below I was peplexed to find water up to the floors. The extra pressure of 600 litres of water was too much for one of the fresh water connectors which popped off the terminal and emptied 300 litres into the bilge. It was a very quick fix to reattach the rose and secure the hose clamp and pump out most of the water. The second 300 litre tank was already isolated and almost full so we had enough for the planned days away. Over the days away I went over all the hose clamps on Passion X and found that the hose had relaxed on many of the fittings and the clamps could all be tightened. I had performed a hose clamp check over 6 months after the launch and was disappointed that this had not been enough. On the bright side the bilges had a very thorough fresh water wash down which cleaned up some of the residual construction dust. The start was uneventful and better for the commentary coming over the phone so we quickly headed out through the heads and turned north. Refuge Bay was just that. A refuge from the internet age with almost no signal, no newspapers and no coffee man. Left to our own devices we had a relaxing few days of swimming and just a little boat cleaning. The Bay was near full but we were not disturbed on the Gosford Sailing Club mooring. The best features on board during the stay were the boom tent that sheltered much more of the yacht than the typical spray dodger and bimini and we did see one yacht attempt a make shift boom tent to augment their fixed spray dodger and bimini. Next would be the fridge which kept the steak frozen for three days despite leaving it off overnight. The large alternator on the Yanmar charges the batteries almost twice as fast as on our previous yacht and that was good for us and our neighbours. After that the hot water shower on the transom was well received. I did have a fresh water shower in the waterfall in the Bay but Elaine preferred the civility of the warm water on board and we had enough despite losing 300 litres on day one. 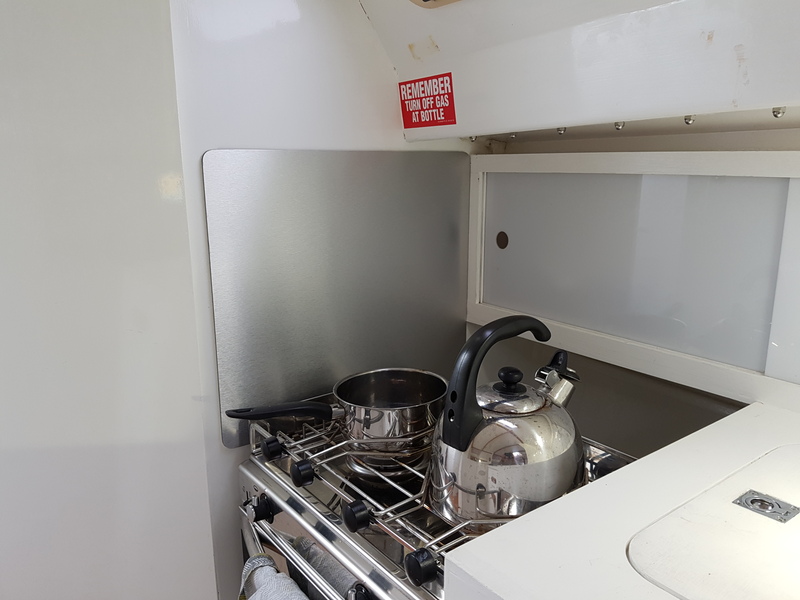 The new heat shield on the stove was fine and better than on our production Jeanneau but after reading up on the European directives for stoves I will install a small shield on the fridge side to be compliant with the fine print. The trip home on Saturday was disappointing as the promised fresh north west winds did not arrive and the swell was uncomfortably on our stern quarter providing plenty of rolling motion. In deference to Elaine’s discomfort I started the motor which added a couple of knots to our boat speed and made for the heads as fast as possible. I normally go below without discomfort but was quick to leave the cabin and full of sympathy for Elaine. noticed the reef line slipping through the rope clutch and that explains the problem we have had since launch. After a bit of research I found it is a very common problem and will bulk up the line with an extra cover which will also extend the life of the rope. As the afternoon wore on Elaine agreed we should shake out the reef and try to speed up the journey but it was not much help and for a while the main was sheeted on the centre line as were other yachts on the same course. At the heads the breeze jumped to 20 knots for a very short period. The initial gust came while we were on autopilot which could not compensate for the sudden change so we had a round up but once the boom was out to the correct wind angle we had a fast ride up the Harbour to Kirribilli where the wind left us again. Those who did brave the damp sailing gear and stayed for the Christmas celebrations were rewarded with another great evening despite the woeful conditions. For the black fleet the longer course and late start time meant we were sailing in quite heavy rain for the second half of the race. The racing itself was marred with some quite unfortunate incidents. 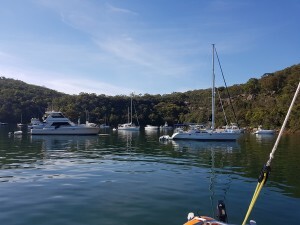 We were lined up nicely on the line on port tack when a leeward yacht tacked in our water and we had to take evasive action which cost us our slot on the line and put us in the path of other starboard tackers which we would otherwise have easily cleared. When we were able to tack to port to cross the line we made up a lot of ground and passed Dump Truck and Lisdillon in a group becalmed in Humbug. We pulled through well to be on the transom of Meridian and lifting into the new breeze. Unfortunately the earlier starting fleets were all coming across on starboard and we were forced back into the shore twice by starboard tackers until we took some sterns and headed off to Long Nose following Joli. In this one phase pinned against the Manns Point shore we lost a lot of ground with Avalon, Utopia, Dump Truck, Much Ado V and Meridian all getting through by quite a distance. Ausreo, Irikudanji and Lisdillon also pulled through. We rounded Goat Island near the back of the fleet, which was disappointing considering the reasonable exit from Humbug, and set off after the fleet. Approaching Long Nose we picked up a following breeze and were able to round inside Ausreo, Irikundji and Lisdillon and not far behind Joli. On the run to Cockatoo Island we almost overhauled Joli when we attempted to pole out the genoa to port just as the wind veered ahead. In a few moments Joli drew ahead again and Irukandji steamed up from behind to go between us and Joli. Those two were locked in close mortal combat close into the wind shadow of the island allowing us to go wider and pick up wind coming over the island. Our success was short lived as we could not climb out into clear air and had to suffer disturbed air from Irukandji from which we never recovered. Much Ado V crossed the line about 9 minutes ahead in conditions I felt we should be much more competitive. Dump Truck also did well and their bottles of wine from their handicap places were passed down the line to skippers who put up with the conditions and stayed for the festivity. The bottle of wine for third place was eventually taken by eighth place on handicap, Sweet Chariot with Passion X a surprising ninth out of thirteen starters. I did manage it install the heat shield for the stove in preparation for a trip to Pittwater after Christmas and that was one success for the day. Stainless steel heat shield at the side of the stove ready for a post Christmas cruise. When it comes to motivation there is nothing like a deadline to get some action. 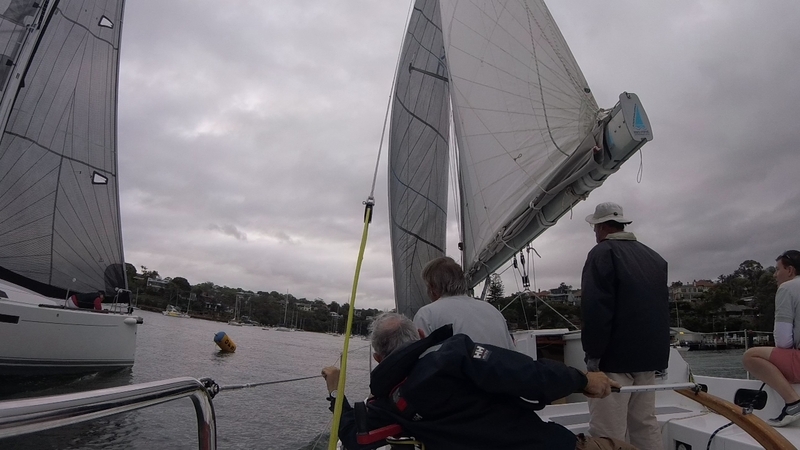 Our current deadline is a planned cruise to Pittwater after watching the start of the Sydney to Hobart yacht race on Boxing Day. 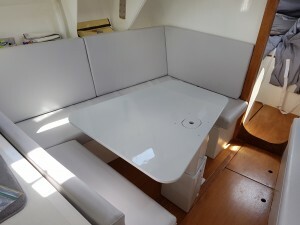 For the cruise I wanted to have the dinette installed and the repainted bowsprit reinstalled with a stronger bob stay. Well the deadline worked and I drew a line under the number of coats of two pack polyurethane I sprayed on the bowsprit and the table top. They are not perfect but are in keeping with the glossy two pack polyurethane sprayed finish on the topsides. 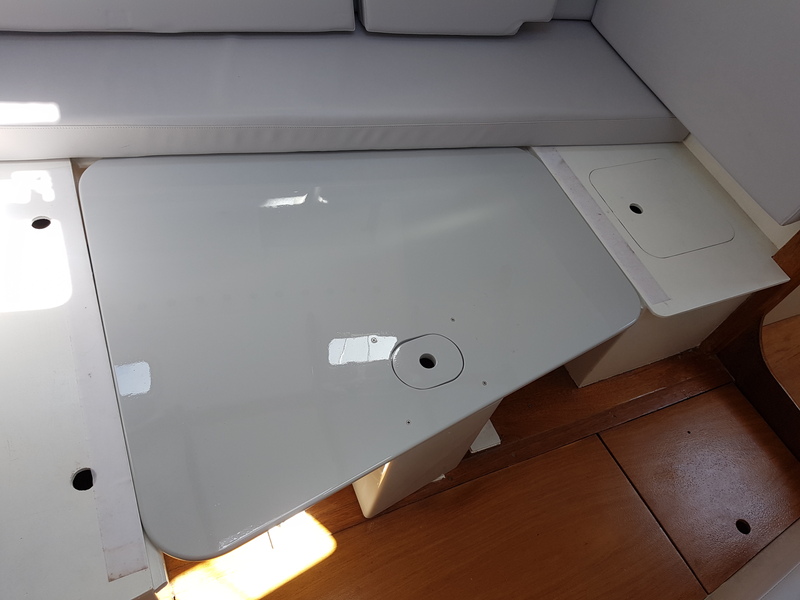 The sliding two part support for the table top has been lubricated with candle wax and the inner top section slides neatly inside the outer box. The dinette project started in early September and with no deadlines has dragged on. By 25th October I had done a trial fit and was able to glue the two layers of 9 mm ply together to form the table top. By the 20th November enough coats of epoxy and filler had been rolled and brushed onto the timber so that it was ready for the final spray primers and polyurethane undercoat and top coat. By the 5th December it was completed and left to cure until today. The new bob stay from 6 mm dux was spliced last night using two fids I made from aluminium tube in the garage and in another just in time moment it was ready to be installed today. 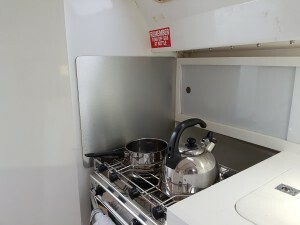 Another job that has come to the top of the list for the cruise away is the heat shield for the gas stove. 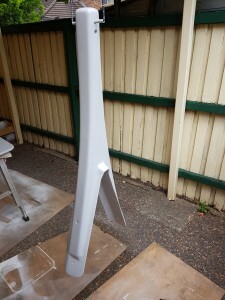 I have a very nice stainless steel laminate with thin steel on the two faces and a stable filler between. A 500 mm wide by 450 mm deep panel will be installed with double sided tape leaving an air gap to protect the painted side of the galley. It was cut and cleaned up tonight ready for installation tomorrow. With these jobs Passion X is essentially complete as planned but no yacht is ever really finished and in early January we plan to have a professional spray dodger fitted. 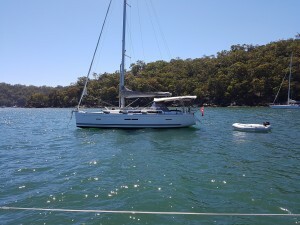 It will be a bit late for this cruise but should be a great addition for our cruise to Port Stephens in April. The north east breeze hung in around the 5 to 15 knots range for the evening although I did see one gust over 17 knots while we were waiting for the start. As happened last week a few including Irukandji and Ausreo started on starboard working along the line and across the direction to Onions Point. 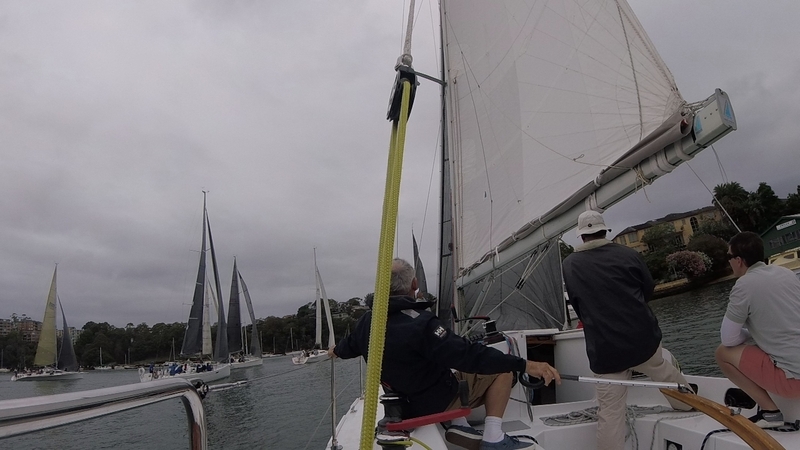 This week we managed to duck Irukandji and cross in front of Ausreo but were forced low onto the pin and in the dirty air of Much Ado V. That was the closest we got to Much Ado V all evening as they tight reached to the point and streaked off to a fastest times win for the night. Just behind Much Ado V we were buried in disturbed air and rounded Onion Point mid fleet. At this point we could not see Avalon and Utopia and did not see them again until the finish. The rest of us lesser mortals were becalmed in Humbug and blanketed by the following fleet including the big Ausreo. Flashback made a valiant attempt to pass to windward while Lisdillon was doing well tight against the Onions Point shore. Dump Truck was in the middle with yachts on both sides. Eventually the breeze went behind and we were able to hold out the genoa to windward to capture whatever breeze filtered over the fleet behind. The course was to round Cockatoo Island to starboard but we drove as hard towards Clarke Point as we could without running into Lisdillon. Flashback and Dump Truck were now becalmed to the port of us and the breeze was tending even further north allowing us to carry the big genoa on Passion X almost to Cockatoo Island. The light and nimble Dump Truck managed to round in front but now we both had to contend with a breeze almost dead astern with a large following fleet. Alongside Cockatoo we were being pushed by Joli so we could not afford to go too wide and at the end of the island were left in the wind shadow. Dump Truck three boat lengths to leeward picked up breeze from over the top and took off heeling with the wind pressure. We waited and waited and waited but it was all we could do to keep close to the island and keep Joli behind. The price for keeping joli behind was paid when we rounded the west end of Cockatoo and saw how big a lead Dump Truck had over us. We pinched to clear the ferry wharf on the east end of Cockatoo and took off in a futile pursuit of Dump Truck and determined to keep the rest of the fleet behind. This we did until the rounding of Goat Island where Joli slipped by in closer to the island that we thought prudent but it worked for them and they headed off back to Long Nose half a boat length ahead. At the same Goat Island rounding the chasing fleet came through with good wind and now we had a seven boats behind with most doing well on the evening and vying for handicap honours. The run back to Cockatoo was interesting in the proverbial sense. 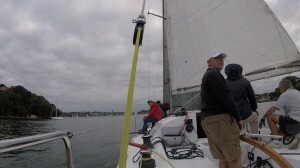 We ran on starboard gybe to have rights but just a little bit by the lee so that we had clear wind on Joli. 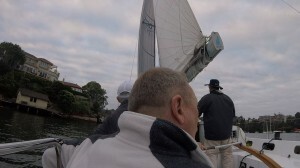 That put our course close to the Cockatoo shore. We like running by the lee in the Laser class fleet and can go very hard to leeward but with the big poled out genoa there is a limit to how far one can go without collapsing the genoa in the wind shadow of the mainsail. Eventually Joli gybed to port and started working up to our position. 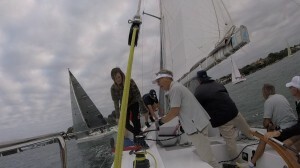 We had to run further by the lee to avoid them to the point we had to ease the vang to keep the mainsail from accidentally gybing. Eventually Joli gybed back onto starboard but with their boom and our pole overlapped we had to take further evasive action. 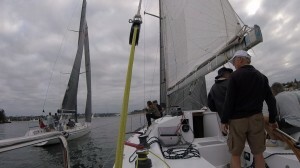 Being further out from the island was again an advantage as we picked up the breeze first and managed to reestablish the lead we had before the Goat Island rounding. The task now was to cover Joli to the line. Ahead at Valentia street we could see Utopia who had been passed by Dump Truck around the end of Cockatoo Island the last time but this time on the inside and close to the rocks. This was the first time since the start we had seen Utopia and suggests we had a better work along Cockatoo on the way home. Into Humbug we picked the shifts well and were only put off our desired path by the blue fleet Conquista who tacked onto starboard in front at Onions Point instead of passing ahead on port as we had wished. This forced a early tack away and left room for Joli to skim past Onions Point and mount a last ditch attempt to pass to leeward. Perhaps we were lucky for a little knock which made the pin end of the finish line our best course while Joli was a bit tight to make the mark. At one second to midnight they called mark room which we gave but the camera shows both genoas backed and it was only momentum carrying both of us across the line. The finishers gave it to Passion X by a second but it might have been less than that. The first five handicap places went to Ausreo, Fireball, Irukandji, Flashback and Sweet Chariot while the spring series fastest times yachts Avalon and Meridian suffered from their well deserved handicaps and took the last places but got given back plenty of handicap for the next race. It is a tough fleet and it is good to see the results get given a shake and the firsts one week easily able to manage a last the next. 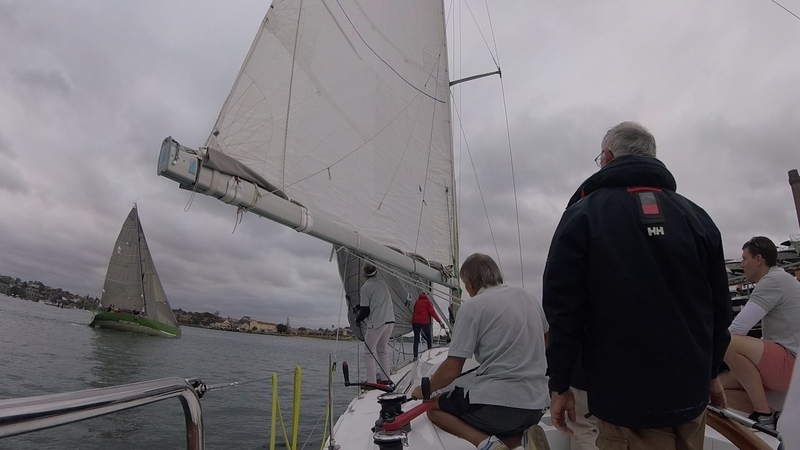 The light forecast for the evening was realized and the breeze frequently dropped to just a few knots adding to the frustration of tricky course. 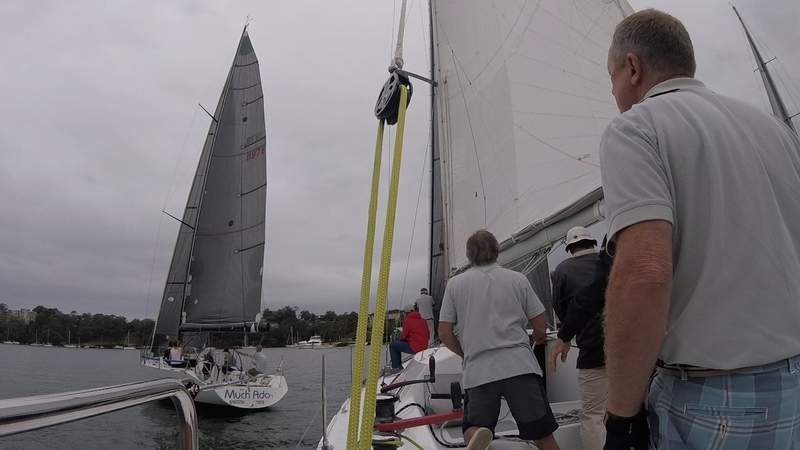 The line could not be crossed on Starboard but that did not stop a couple of yachts starting on starboard at the pin mark and forcing the fleet to tack away from the course to Onions Point. Jackpot, Meridian and Joli seemed to get away on Port well as did Lisdillon and Sweet Chariot. The rest of us were put about by Irukandji so that there was a line of frustrated Sydney 38,s and Ker 11.3′s sailing away from Onion Point waiting for a chance to tack back onto port. We tacked when Irakandji did and were promptly knocked back into the point. We took sterns and went as close to the moorings at Onions Point as possible and tacked back with rights to recover a little ground. That gave us a position between two fleets with four J Boats and one RP36 up front and everyone else behind. In Humbug the breeze left us to wallow along while ahead we could see the fleet lifting and leaning into fresh air. Behind Much Ado V and Dump Truck were coming steadily with fresh wind from behind and they passed us. Much Ado V to windward and Dump Truck to leeward but pass us they did. Our weakness in the variable conditions is changing gears fast enough. The very heavy boom and centreline sheeting keeps the leech of the mainsail very closed where a very twisted leech has some area of the main working in the shifty conditions. On the work to Goat Island we were passed by first Avalon and then Utopia. There was not a lot of difference in the straight line speed but their non overlapping jibs tack much faster than our similar area 140% jib. That was the end of the parade of yachts passing us and we in turn passed Lisdillon and Sweet Chariot who had made a good start through Humbug. Coming back into Humbug we were heartened to see Much Ado V not too far ahead but once they sailed out of the doldrums it was out turn to sail in and the leading yachts all finished 5 minutes in front all the way back to Utopia who was one minute 20 seconds in front. There was a minute and 46 seconds break back to Sweet Chariot who took handicap honours by two minutes and five seconds courtesy of their very good start. We were pretty disappointed in our two spells in Humbug and need to find a way to change the mainsail into and out of drifting mode very quickly. 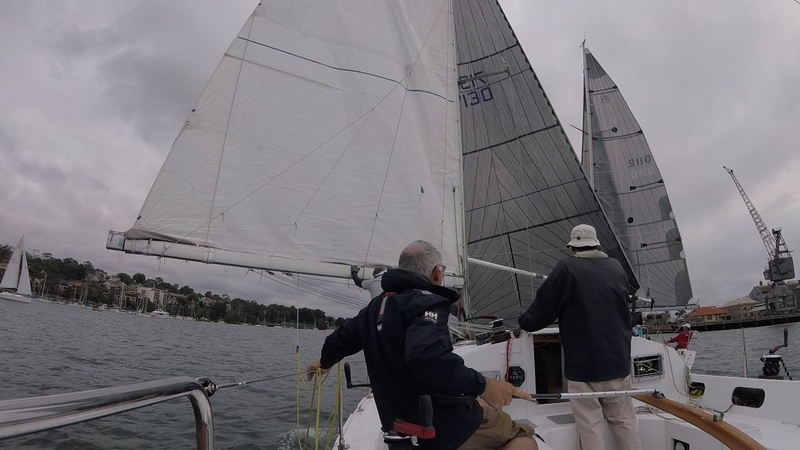 Meridian had another very fine line honours and we were surprised that their very stiff handicap brought them one place back behind Passion X in the handicap list and we remained tied on handicap for the Spring Series. Jackpot made a return to the fleet with a second fastest after a short stint in front and a second place on handicap. While we were disappointed with our eighth place spare a thought for the crew on Avalon who went from roosters last week to feather dusters at 14th this week but they must be pleased with their first and third places in the series off a fairly stiff handicap. 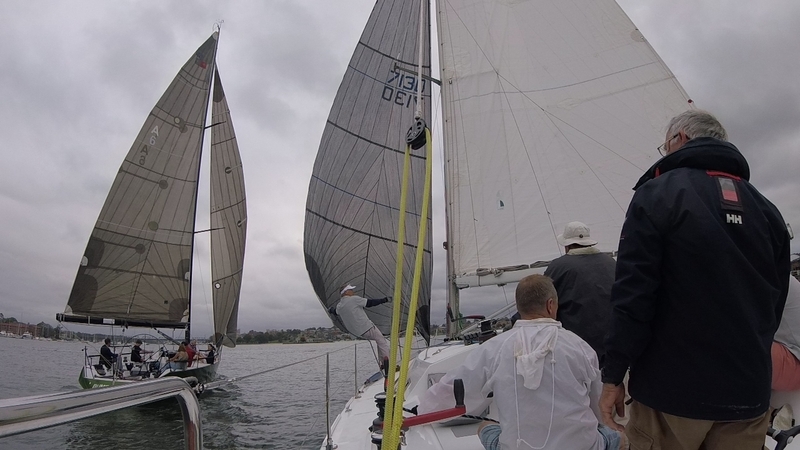 Avalon did take out the scratch series by a point from Meridian so there is some pretty close racing at the front of the fleet. We managed to tie with Joli on 4th fastest but they did sail one less race and so had a did not start to discard while we were able to discard our eighth from tonight. Third place on scratch went to Much Ado V so there is a healthy mix of yachts at the top end of the fleet. The current handicaps tell a better story of the potential performance of the fleet with the ranking after this week being Avalon, Meridian, Much Ado V, Utopia, Jackpot, Dump Truck, Joli and Passion X.